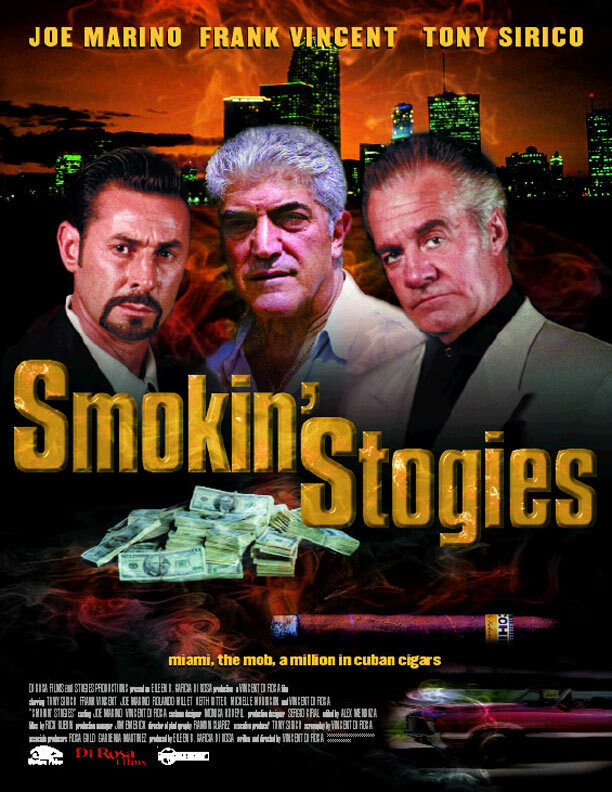 When ruthless New York mob boss Tony Batts (TONY SIRICO) sends his trusted capo Vinnie Marscone (JOE MARINO) to Miami to trace $1 Million in smuggled, but now missing, Cuban Cohiba cigars, things start to heat up. The Mob in Miami are also trying to help Vinnie find the missing Havanas. Marscone is led on wild chases, kidnapped, and held at gunpoint. With a fast boat, a beautiful blonde and a narcotics sniffing ex-U.S. Customs dog named “Bruno”, Vinnie tries to save the cigars and his life. So who has the cigars? The drug dealers, the FBI, and the Mob are all part of this hilarious, unpredictable adventure through the hot streets of Miami. "Smokin' Stogies" is a movie where anyone can get killed... but no one gets hurt!